I consulted BugGuide.net and identified the mystery insect as Mydas tibialis, or the golden-legged mydas fly. Mydas flies are true flies, members of the insect order Diptera. The genus Mydas includes our largest flies. Not only are they large, but they mimic stinging spider wasps, an adaptation that may keep predators at bay. But, fellow humans, fear not–mydas flies don’t sting and are harmless to us. In fact, they may be beneficial because their larvae feed on beetle grubs. 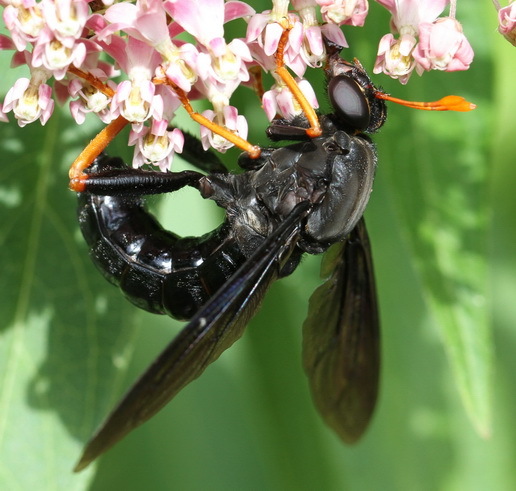 There are 17 species of mydas flies in North America. 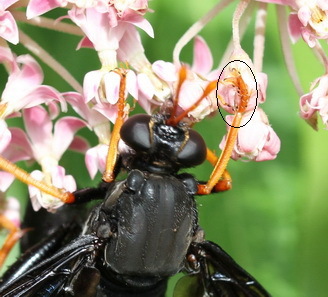 The golden-legged mydas fly is identified by its totally black body and its orange antennae and lower legs (the tibia and tarsi). Information about its distribution and life history is sparse. It occurs in eastern North America, but apparently has a very brief adult stage so it may not often be seen. 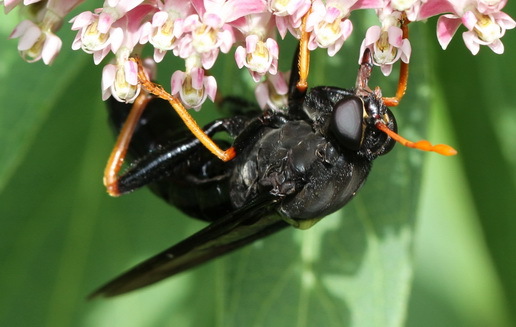 Adults have been observed feeding on the nectar of several species of flowers, including the swamp milkweed that my garden visitor was enjoying. Based upon my observations and my camera’s time stamp, the golden-legged mydas fly spent over 59 minutes feeding on my garden’s swamp milkweed, picking up milkweed pollinia (pollen sacs) as it foraged. But it totally ignored purple coneflower (Echinacea purpurea) and bee balm (Monarda fistulosa) that were blooming nearby, suggesting that it is somewhat of a specialist feeder. I saw an unknown wasp-like creature the other day, but it’s not the mydas! Thanks for your comment, natureintheburbs. Hope you can ID your mystery insect. I would have thought the Midas name came from the golden legs. I’ve used BugGuide.net quite a few times. The people are so helpful there. Thanks for your comment, Deb. Yes, the Midas name does make sense given the golden legs. And, I’ve found BugGuide.net to be the best source for identifying unknown insects.